Why do some people always suffer from side cramps while running whilst others do just fine? Actually side cramps or side stitch are very common among runners and although not an injury in itself, cramps can be a real nuisance and quite disruptive to your training and racing. I am going to be talking about side cramps on this page but if you want to know more about leg cramps, then click here. A side cramp or side stitch manifests itself as a sharp or kind of stabbing pain just below your ribs. It can be on either side but is more commonly felt on the right hand side. Basically what is happening, is that your diaphragm is going into spasm. 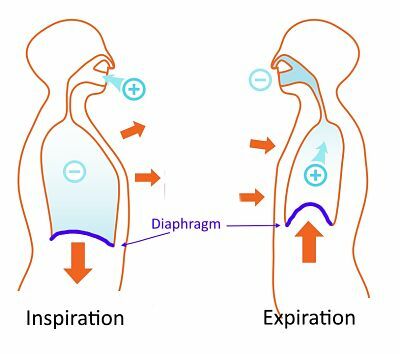 In a normal situation, as you breathe in, your diaphragm moves downwards to make way for your expanding lungs and as you breathe out, your diaphragm moves upwards to fill the space where your lungs have deflated. However several things can disrupt this normal mechansim. More experienced runners might suffer if they have eaten a heavy or fatty meal too close to a running event. Your full stomach pulls the diaphragm downwards, causing it to become irritated and to go into spasm. Also highly sugared drinks and fruit juices drunk just before a running activity are also though to cause cramps although the reason is not quite clear. It is also thought that those people who have a slightly more curved upper spine compared to the average person, are more likely to suffer from side cramps. Often people will complain of pain at the tip of the should as well as below the ribs when they have cramp. The nerves that run to the diaphragm and to the shoulder, originate from the same vertebrae in the spine so there seems to be some link. If you know the possible causes then you can try and minimise any side cramps while running. Avoid very sugary drinks and fruit juices in the hour before running. Best to stick to water or a beverage with a low sugar content. Avoid eating a big meal within 3 hours before a race or a heavy training session. If you must eat something close to starting your race or session then have something small and light (small snack size) that is easily digestible and leave at least 30 minutes before starting your run. If you are a new runner or you find that you are constantly out of breath, then try running slower and be more conscious of you breathing. Slow and steady wins the race. I am a big fan of low heart rate training and most my runs are done at a very easy pace whereby I am able to talk and run at the same time. Nowadays I rarely suffer from side cramps. Stretch your abdomen and diaphragm prior to running. Stretch your arms and hands up to the sky and hold for 20 seconds. Raise your right arm straight over your head and then bend your torso to the left. Hold for 20 to 30 seconds and then switch sides. Whilst running, sip fluids little and often rather than having a big amount sloshing around in your stomach. The same goes for solid foods - little and often is best. If you feel that you spine might be causing cramps then consider seeing a physiotherapist who could assess your back and see if you would benefit from back strengthening exercises. So you are out running and you feel that dreaded side ache turn into a sharp pain which causes you to start doubling over. What should you do? Stop running. Stand tall and press with your fingers on your diaphragm on the area of pain. Take a long, slow deep breathe in, breathing right down into your lungs. At the same time press with your fingers on your diaphragm so that you are sort of trying to stop your diaphragm expanding. Basically you are pushing against your diaphragm. Then slowly exhale, making sure to fully empty your lungs. Keep doing this until the pain subsides. If you are in a race, it can be difficult to stop running however if you suffer with side cramps while running a race, the best thing to do is to decrease the pace a bit so that your breathing is less labored and more controlled. Then breathe in slowly and deeply, expanding your rib cage as you breathe in and letting it relax as you breathe out. If you can, press on the site of pain at the same time so that you are pushing against your diaphragm. Keep taking these very deep breathes until the pain subsides. This could save your race. Purse your lips when breathing through a side stitch. Imagine that you are blowing out some candles. It is unclear why this works but it certainly helps you to focus more on your breathing. Downhill running can put a lot of extra force on your abdomen. If you suffer a stitch whilst throwing yourself down a slope, then simply slowly down. breathe deeply and hopefully it will go away. How do you deal with side cramps while running?